Please join us for a lunchtime talk with William Reno, Professor of Political Science & Director, Program of African Studies, Northwestern University. 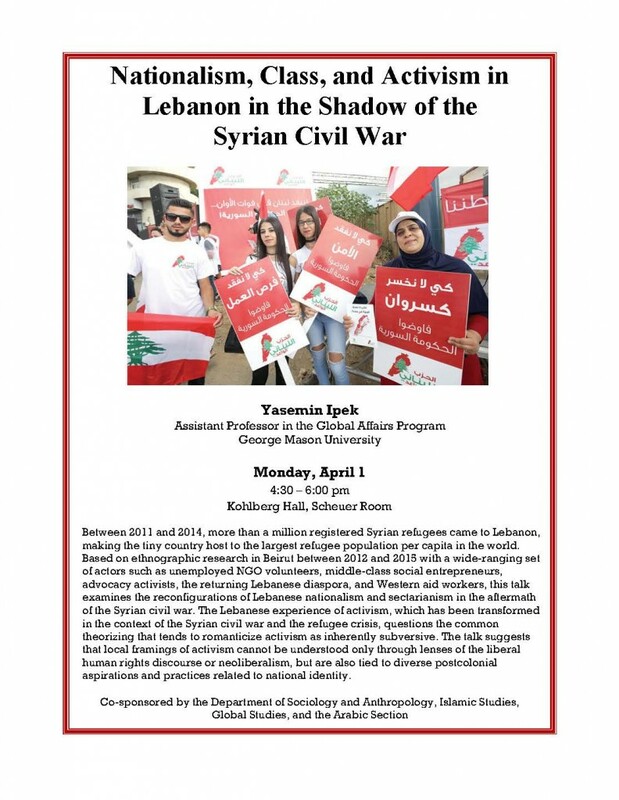 Professor Reno will speak about his ongoing research in the Middle East. A leading expert on political violence, the organization and behavior of insurgent groups and the politics of authoritarian regimes, Professor Reno is the author of Corruption and State Politics in Sierra Leone (Cambridge University Press, 1995), Warlord Politics and African States (Lynne Rienner Publishers, 1998) and Warfare in Independent Africa (Cambridge University Press, 2011). He visits Swarthmore from Iraq. The Daily Gazette presents Ben Taub, a highly successful foreign correspondent with numerous articles published in The New Yorker. A little over 2 years ago, Ben Taub was a philosophy student at Princeton, and a recent contestant on “The Voice.” He has since reported extensively about ISIS recruiting and ordinary lives in war-torn Syria. 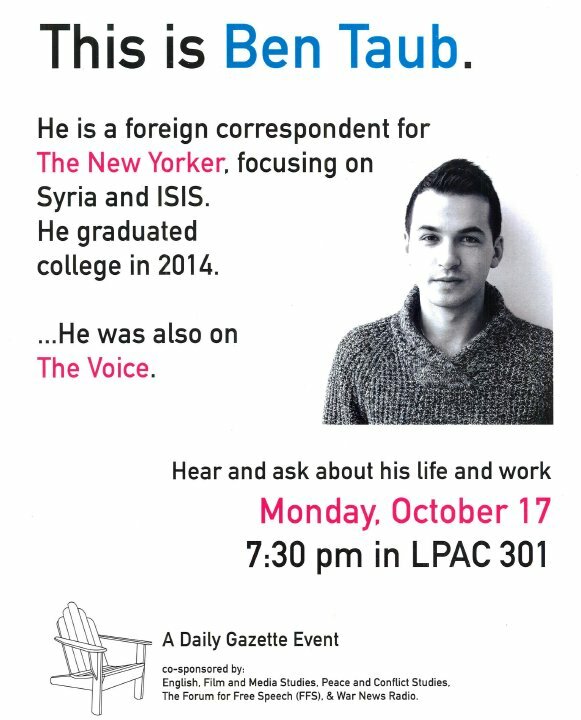 On October 17, he will speak at Swarthmore about how he got where he is, his work, and his experiences in war reporting. We are thrilled to announce that Dr. Sa’ed Atshan will join the Peace and Conflict Studies program for the fall semester of 2015! Dr. Atshan graduated from Harvard University in 2013 with a Ph.D. in Anthropology and Middle Eastern Studies. He holds an M.A. in Social Anthropology from Harvard, an MPP from the Harvard Kennedy School, and a B.A. in Political Science and Middle Eastern Studies from Swarthmore College. 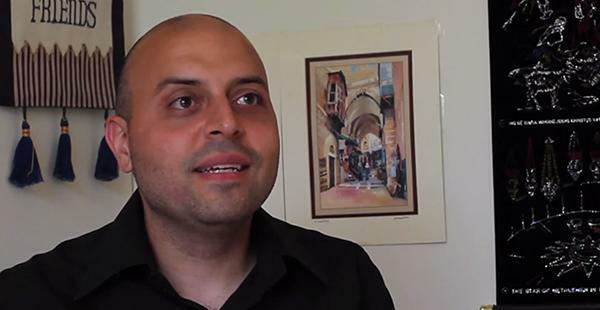 He is currently a post-doctoral fellow at the Watson Institute for International Studies at Brown University. Dr. Atshan designed and taught courses at Harvard and Brown on social movements in the Middle East and the Arab Spring, among other topics. He has earned four of Harvard’s excellence in undergraduate teaching awards along the way. Sa’ed has won multiple awards and fellowships from important organizations that include the National Science Foundation, the Woodrow Wilson National Fellowship Foundation, Social Science Research Council, and the Paul and Daisy Soros Foundation, and in 2009, he was awarded a Kathryn Davis Fellowship for Peace. We look forward to having such an innovative scholar and teacher join our program! 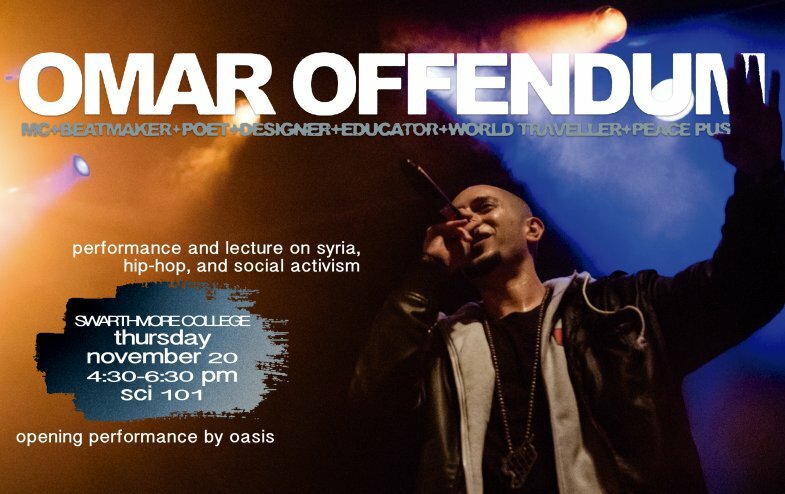 Omar Offendum will be coming to Swarthmore on Thursday, November 20th to give a hybrid performance/lecture. In addition to performing some of his songs, he will speak about connections between the artistic community and the Arab uprisings, with a special focus on hip hop. Omar will also discuss his efforts to use art and music to raise humanitarian relief funds for Syrian refugees. Opening performance by OASiS. Omar is a Syrian American hip-hop artist, designer, poet and peace activist. He was born in Saudi Arabia, raised in Washington, DC, and now lives in Los Angeles, California. He tours the world performing at international music festivals, lecturing at major academic institutions, and fundraising for humanitarian relief organizations. Most recently, Offendum has been involved in creating several critically acclaimed songs about the popular democratic uprisings throughout the Middle East & North Africa. He is also working on several new collaborative projects while touring to promote his solo work. 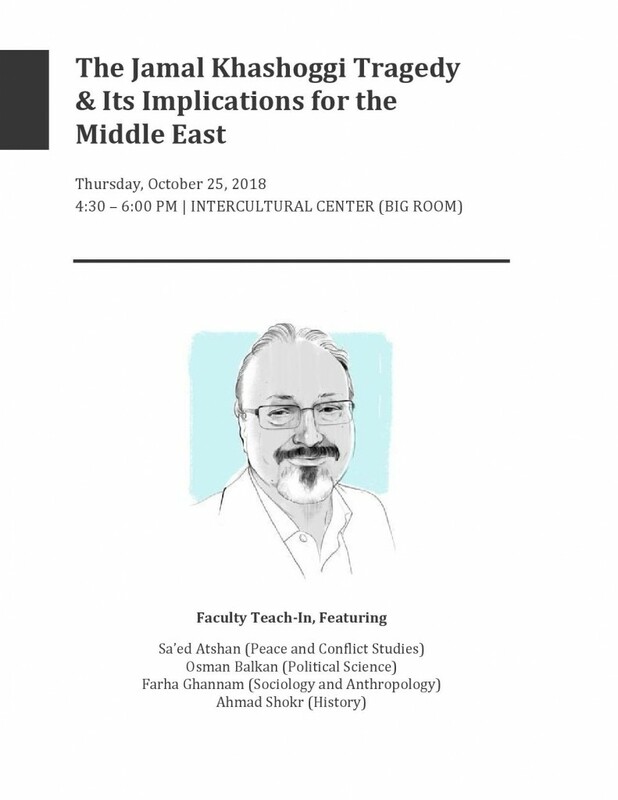 This event is sponsored by the Arabic Section (MLL), the Intercultural Center, the William Cooper Foundation, the Islamic Studies Program, the Peace and Conflict Studies Program, the Department of Music and Dance, and the Muslim Students Association. Founder and Director of the Interreligious Coordinating Council in Israel (ICCI) since 1992, Ron Kronish is also a noted rabbi, educator, author, lecturer and speaker. 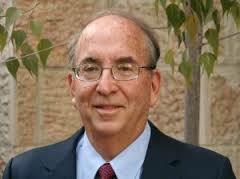 He has lived in Jerusalem for the past 35 years, serving as Director of the Israel Office of the American Jewish Committee, Director of Staff Development and later Co-Director for the Melitz Centers for Jewish Zionist Education, and lecturer in education at Tel Aviv University and at The Hebrew University of Jerusalem. Dr. Kronish lectures to a wide variety of groups in Israel, including synagogue groups, Jewish community missions and Jewish, Christian and interreligious groups. In addition, he has been a scholar-in-residence in universities, synagogues and communities across the United States, Canada and Europe and in the Far East. Educated at Brandeis University (BA), Hebrew Union College – Jewish Institute of Religion in New York (MHL, rabbinic ordination) and the Harvard Graduate School of Education (doctorate in philosophy and history of education), Dr. Kronish has published articles and essays on Jewish politics, faith communities and the peace process, as well as education, culture and contemporary issues in America and Israel. He has represented ICCI at the Vatican and at many international conferences, and is frequently consulted by media representatives for background information and briefings. In addition, he blogs regularly for the Times of Israel and the Huffington Post. Dr. Kronish is the editor of a new book,: Coexistence and Reconciliation in Israel: Voices for Interreligious Dialogue (2015). In addition, he has edited: Towards the Twenty-first Century: Judaism and the Jewish People in Israel and America, an anthology in memory of his beloved father, Rabbi Leon Kronish, Toward the Third Millennium and Pilgrimage in a New Millennium. He lives in Jerusalem with his wife Amy and is the proud father of 3 wonderful daughters (and 3 wonderful sons-in-law) and the even prouder grandfather of 4 fabulous grandchildren. Please join us for a lecture followed by refreshments and a question-and-answer session. Hosted by J Street U and the Israeli Cultural Society. Funded by the Forum for Free Speech and Peace and Conflict Studies. The Arab Spring, Four Years Later: Hope or Despair? Four years on, the Arab Spring had generated wildly contrasting outcomes. From democratization in Tunisia to authoritarian revival in Egypt to civil war in Syria, the regional wave of popular protest has certainly washed away the foundations of the old order. Can democratization spread to other countries without incurring the risk of war? This lecture aims to answer this question, giving a bird’s eye view of different processes and events from a political scientist’s perspective. Sean Yom is Assistant Professor of Political Science (comparative politics). 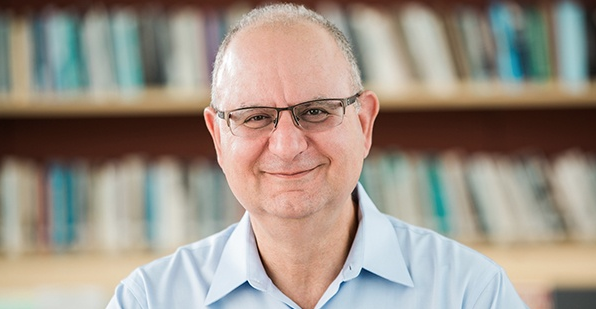 His research broadly focuses on authoritarianism and development, and he is now finishing his first book on state-building and political order in the post-colonial Middle East. Sponsored by the Islamic Studies Program. Ann Mosely Lesch ’66, Professor Emeritus of Political Science, American University in Cairo, will present the 2014 Islamic Studies Annual Lecture, “Troubled Political Transitions: A Perspective from Egypt”. 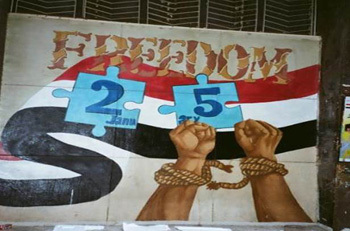 Three years ago, Egyptians rose up to remove Hosni Mubarak’s corrupt authoritarian regime. Since then, they have been on an emotional roller-coaster, from the excitement of participating in three elections, to rising anger during the Muslim Brotherhood’s presidency, and then taking back to the streets to remove that president. Today, they face uncertainty as to whether presidential elections will strengthen democracy or entrench the security state. 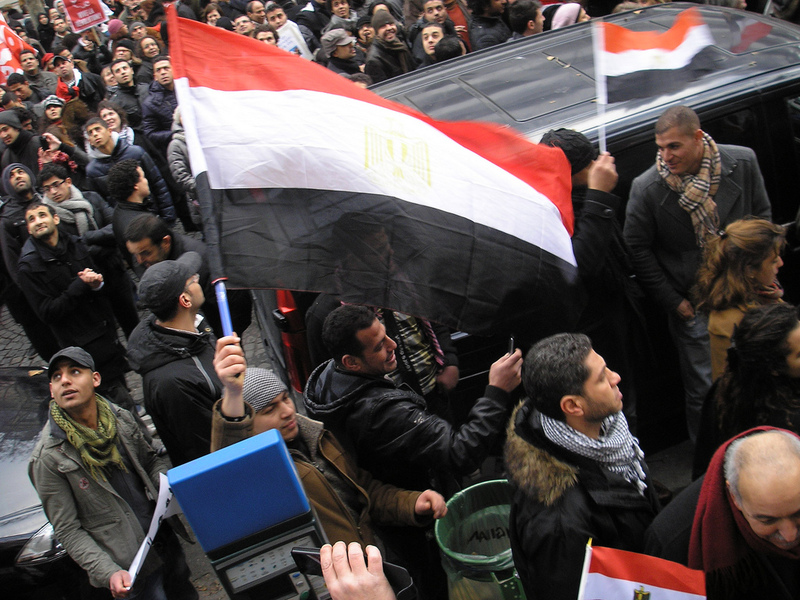 Given Egypt’s centrality in the Middle East, it is important to examine and assess its troubled transition. 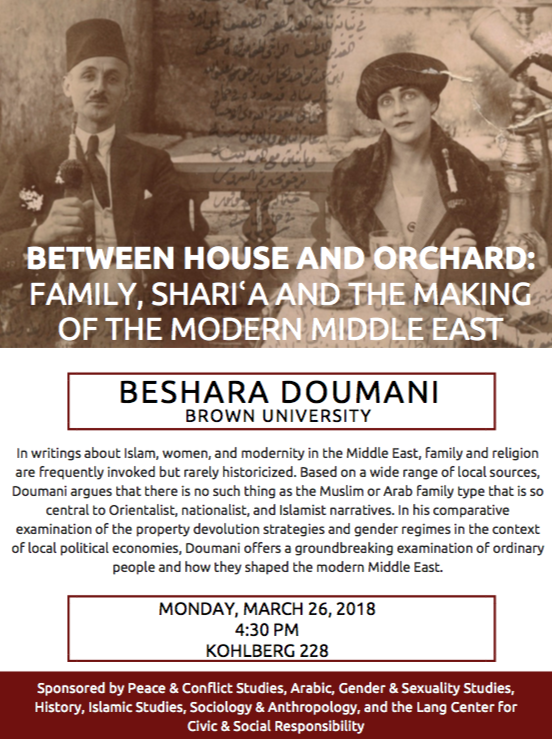 Sponsored by the Islamic Studies Program, Arabic Section of Modern Languages & Literatures, Department of Political Science, and the Department of Sociology & Anthropology.